Pantip Plaza is an indoor IT shopping mall located on New Phetchaburi Road in Ratchathewi district, Bangkok, Thailand. It has satellite locations in Nonthaburi, on Bangkapi Road, and in Chiang Mai. Why Pantip Plaza is special ? Pantip Plaza is the mother of all IT shops in Thailand and has gained legendary status as the place to find new and used computers and accessories at rock-bottom prices. Occupying a rather featureless building on Petchaburi Road, Pantip Plaza has also gained notoriety because of the widespread practice of selling counterfeit software, DVDs… and more sordid material. The mall itself has certainly seen better days, but like an old auntie that always has lots of candy when you go to visit, Pantip Plaza is still pulling in the punters thanks to unbeatable bargains and cheap technical specialists for things like repairs and upgrades. 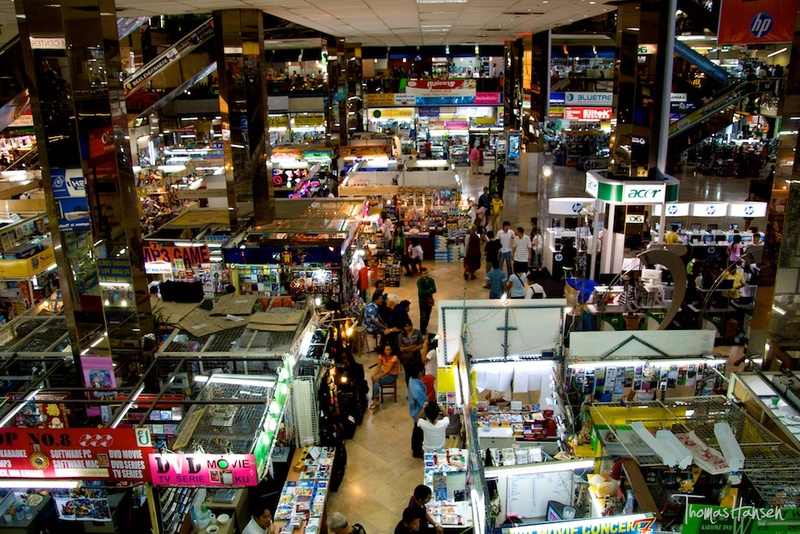 What to explore at Pantip Plaza? How to get to Pantip Plaza? From BTS Chidlom, either hire a tuk-tuk/taxi or walk ten minutes down Ratchadamri Road past Central World on your left, over the Saen Saeb canal and then left on Phetburi Road. Walk about two blocks, and Pantip Plaza should be on your left. IT City, situated on the fifth floor, is the biggest IT store in Pantip Plaza, displaying and selling the latest equipment. The problem for some is that Pantip Plaza openly sells counterfeit products alongside genuine, top-of-the-range models, but it is important to remember that Pantip Plaza has been operating for well over 20 years and the vast majority of shopkeepers aren’t trying to rip anyone off. You should compare prices to get a good deal. No warranty or anything of that sort in most stores. If you want hassle free tech shopping under one roof, this is the place to go. Don't be shy to bargain.